‘Vajra’ means ‘ thunderbolt’ or ‘diamond sceptre’. ‘Vajra’ is the Indian Sanskrit name. In Tibet it is known as a ‘dorje’. Like many of the symbols of Tibetan Buddhism, it has a long lineage. It probably derives from the attribute and weapon of the early Indian sky and storm god, Indra, the primary deity of ancient Indian peoples. Like the ‘phurba’ or ‘iron nail’ it has precedents in shamanic practice for dispelling and controlling spirits. The vajra is the symbol of the emergence of the universe. It clearly echoes the form of a tree. The central point of the vajra is the sphere, symbol of the primordial creative void, the true nature and source of both emptiness and form. This is the seed or the heart (the core or the trunk) of the Tree of the Universe. From here arises the first manifestations of energy: the primal elements and their interactions. This is where the trunk begins to divide into separate boughs and roots. Next, the vajra expands further into clearly separate parts, the spokes or tines, each dividing into apparently distinct entities and individualities in time and space. These qualities of time and space come about through the apparent separation of form and emptiness – represented in the vajra by the alternating bands of metal. The enclosed space within these tines echo the shape of the original, central sphere – the true nature of all apparent manifestation is that nothing other than this exists. This void is recapitulated as each tine returns to unite in a final point where all individuality and difference merge together once more. The branches and roots of the tree spread out from the point of origin, yet in terms of both electromagnetic energy patterns, movements of the water cycle and other natural processes within the tree, the divergent manifestation forms a closed circuit of energy, a continual return to the source and then further outward expansion. The universal balancing harmony of the vajra shape, together with its dynamic, wrathful, feel make it a powerful symbol for protection and unity. We can develop a visualisation process that mimics and manifests the energy of tree as vajra within our own energy fields. This has a spontaneously balancing and purifying effect. It is not so important where you ‘place’ this visualisation. It may be clearly superimposed upon or within your own body, or it may be easier to see it just within your mind. Do what feels easiest at first, and with familiarity integrate the imagery more clearly within your sense of body, time and space. 2. It will always be more anchoring to begin with an actual tree. One that is present, or one that you know well. 3. In these exercises it will always be better to visualise yourself with a luminous egg-shaped energy surrounding and containing your physical form. Seeing yourself simply as that luminous form with no physical characteristics is sufficient, and may be easier to imagine that seeing “yourself’. Such an image allows the experience of more subtle levels of sense information and a clearer interaction with other levels of awareness. 4. Form an idea or image of the tree you feel you can work with, ( one that seems appropriate, or one that comes to mind as you begin to settle down). 5. In your energy form, consciously move closer towards the tree until you find at a certain distance you begin to enter the atmosphere or awareness of the tree itself. 6. At this place, pause, and greet the tree energy, asking permission to continue with the exercise. (if there is a clear refusal, you may need to work with a different tree energy or centre and ground yourself some more). 7. Move towards the tree until you pass through and into the trunk. Stay still and integrate with the feelings. 8. Become aware not just the trunk where you are, but also the boughs and branches way above your head, and the roots spreading deep beneath your feet. 9. Upon this, superimpose an image of a clear, bright, white vajra, with one end in the topmost branches and the other going to the deepest roots. You will see yourself more or less positioned at the centre of the vajra. 10. Now reduce the size of the vajra so that it is wholly within your body. Take it down to the size that fits inside one of the main chakras ( allow it to go to whichever one it chooses, heart or solar plexus will be most likely). 11. Now enlarge the vajra again so that it reaches from the crown chakra, just above the top of the head, to the Earth Star about a metre below your feet. Maintain this image for a while. 12. 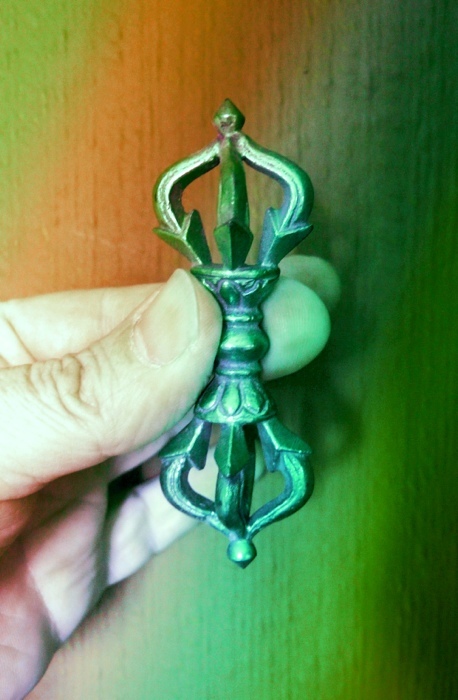 Next reduce the vajra size a little so that its two ends are at the crown and the root chakra. Now rapidly expand the vajra, or sense that it grows in size, moving both up and down to fill the whole of the tree once again. 13. Allow any precise imaginings to dissolve. Simply rest in the space of the tree and vajra energy. Let any communication with the tree spirit or any healing, purifying and balancing processes take place now. 14. When you are ready, become aware of your body again within the tree. 15. Imagine yourself leaving the tree trunk, walking out into the world again. At the tree boundary, turn and say thank you. Return to your normal focus.